Rupert Pupkin (Robert DeNiro) is an aspiring comic who genuinely believes he has what it takes to become a comedy legend. In his determination to make it, he stalks the famous talk show host Jerry Langford (Jerry Lewis) for advice. Langford grows increasing tired which results in Pupkin kidnapping and holding him hostage in order to get his coveted chance of TV stardom. I viewed this back-to-back with “Taxi Driver” and in many senses it can be seen as the perfect companion piece. 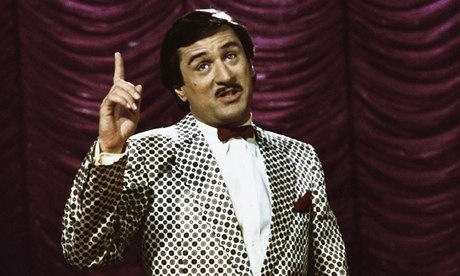 DeNiro’s embodiment of Rupert Pupkin is as memorable as his Travis Bickle and he’s just as much of a social misfit. Bickle had little to say and was seemingly lacking in confidence while Pupkin is overconfident and says too much. Pupkin could easily be seen as a parody of Bickle; both so alike yet through the skill and nuance of DeNiro’s acting, so very different. When you compare both performances there’s no mistaking why DeNiro is regarded as one of the screen legends. Added to which, Pupkin is a far cry from DeNiro’s brutal portrayal of Jake LaMotta in “Raging Bull” and there’s only a couple of years between them. That being said, his performance here is just as unsettling as any of his more grittier, menacing roles. Once again, it’s a marvellous transformation from this exemplary actor. His performance here is simply a chameleon-like, masterclass in how to fully embrace a role. 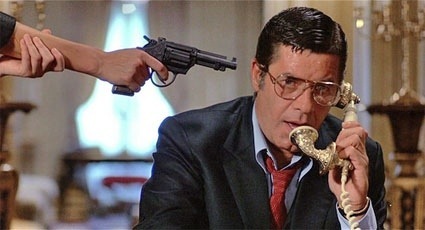 As fantastic as DeNiro is, however, it would be grossly unfair to dismiss the work of Jerry Lewis. Gone is his comedic histrionics from which was he synonymous for and in their place is a smoulderingly serious and arrogant display of a put-upon celebrity who has no time for his fan base. DeNiro and Lewis could easily have swapped roles and the film would have been just as effective but it’s the against-type casting that really adds another level to the film’s power and enjoyment. As for the the subject matter itself, the film is actually more relevant today than it was upon it’s release. We’ve had films that have dealt with similar themes of a media-frenzied public: Peter Weir’s “The Truman Show” being a notable one in it’s reflection of reality television and the morality standpoint of such a form of vouyeristic entertainment. That aside, Scorsese and screenwriter Paul D. Zimmerman deserve the utmost credit in being ahead of their time here. Made in 1981, the glorification of celebrities was not as intense as we are experiencing now which adds a deeper relevance to the film 30 years down the line. It wasn’t greatly received upon it’s release but in hindsight, this is an astutely captured and hugely ambitious satire that’s one of the most underrated movies in Scorsese’s canon. Once again, his daring originality pays-off. Many were surprised with his ability to capture humour most recently in ” The Wolf Of Wall Street” but when you look back this (and “After Hours” in 1985), it’s apparent that he always had that ability. Despite initially coming across as a lighter comedy with hilarious and cringeworthy moments, Scorsese’s work here is actually very dark in humour. Throughout, it has a fine sense for the absurd but there’s no denying that it has a chilling and creepy undercurrent that it refuses to renege on. Under his scrutinisation, Scorsese so succinctly captures the hidden hazards of fame. He shows how obsession with celebrity is unhealthy and captures it from both ends of the scale; from those who covet it, to those who possess it. Either way, the limelight isn’t always bright. Outstanding work from everyone involved and one of the true gems from the early 80’s that’s often forgotten about. Trivia: In the scene where Robert De Niro and Sandra Bernhard argue in the street, three of the ‘street scum’ that mock Bernhard are Mick Jones, Paul Simonon and Joe Strummer – members of the British punk rock band, “The Clash”. This entry was posted on April 29, 2014 at 9:30 am and is filed under Comedy, Drama with tags 1982. You can follow any responses to this entry through the RSS 2.0 feed. You can leave a response, or trackback from your own site. Superb stuff Mark. Definitely one of both Scorsese and De Niro’s most underrated gems, but it’s one of my favourites of theirs. Not watched this in quite a while, definitely time for a rewatch. Cheers Chris. Now that the awards season is over and the superhero season begins, I often look back at this time of year and look at older films that require a rewatch. I done this back-to-back with Taxi Driver and it was a superb double-bill. Two excellent films that really compliment each other. Great review Mark. Wasn’t aware of the back story here – that it was so emotionally gruelling. Thanks Natalie. Yeah, DeNiro and Scorsese didn’t work again until Goodfellas in 1990. 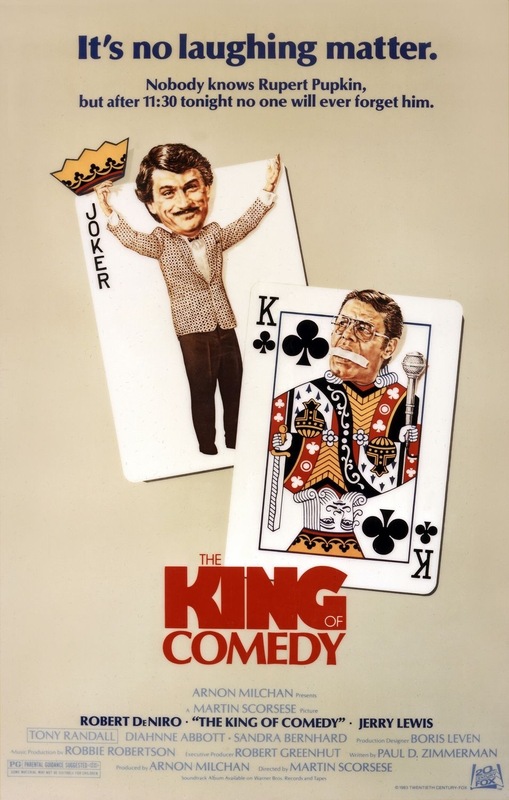 The King of Comedy was actually filmed in 1981 so it was close to 10 years before they’d work together again. Fine, fine review. Do you know this is one movie that I have shamefully never seen. I have had so many intentions of catching up with it but for some inexplicable reason I have not. This really prods me on. I have to see it soon. Good stuff man! Thank you sir! It’s a great film. Not just one of Scorsese’s most underrated but actually one of his best. DeNiro delivers another outstanding performance too and it’s a reminder of how good his comedy timing can be. It’s not without it’s dark elements but it’s the contrast that makes it so intriguing. Got this recorded and ready to watch! Looking forward to it even more now. Great review Mark! Cheers Adam. I watched it directly after Taxi Driver and they make a great double-bill. One of Scorsese’s most unsung movies. What made this movie truly great for me, is when Pupkin finally does his routine, he is actually very funny. As always De Niro shows a deep respect for the character and the story. Spot on observation, Paul. He does actually crack it when he’s given the chance. It’s at that moment that the film shifts another gear. Not only is Scorsese not praised enough but DeNiro’s ability for comedy is actually very good as well. Granted, the comedy material he’s doing these days isn’t great but if given the right script he can be deliver. Midnight Run and Analyze This are two good examples. Great review, man. I agree: sooo underrated. One of my favorites from Scorsese. Superb film. So damn dark, yet, so damn funny as well. Wish Scorsese went for more comedies like this. Good review Mark. You’re first sentence sums the film up entirely, Dan. I too wish Scorsese would attempt more like this. Hopefully wetting his funny bone on The Wolf of Wall Street will bring at least one other comedy before he calls it a day. Cheers buddy! I still haven’t seen this and I really feel like I should. Indeed you should Abbi. It’s a little gem of a film. Funny, yet so creepily uncomfortable. Nice review. This is a top five Scorsese movie for me and I agree it’s a great companion piece to Taxi Driver. Also, I got the opportunity of seeing a special rescreening attend by Scorsese, De Niro, and Lewis. Cheers Charles! I can totally understand it being a top five amongst Scorsese’s work. Fabulous film. Man, that screening must have been great? I would love to have been there. I still need to see this one Mark! Wow I have no idea Martin Scorsese actually has a starring role too, that’s awesome! I can’t believe I’ve never seen this! Sounds excellent – and I like the idea of back to back with Taxi Driver, which I’m definitely due a re-watch. Thanks! I think this is five stars; both the review and the film. Scorsese and De Niro simply couldn’t put a foot wrong at the time. I always appreciate your kind words, mate. I did consider 5 stars as it’s simply a sublime piece of work. The only thing that stopped me was some very brief pacing issues where my mind started to wander a little. That was probably just where I was at when watching, though, and no fault of Scorsese’s. I can completely understand top marks from anyone who thinks so. shelley hack was so good in this movie. what was all that stuff about her not knowing how to act? “charlie’s angels” was fluff and had already the flop written on it the season before shelley joined it. but ii tnis movie, shelley showed that given good material, she more than rises to the challege! shelley had the right stuff! I never actually made that connection with Shelley Hack and Charlie’ Angels. I knew I had seen her somewhere before. You’ve enlightened me there, man. LOVE this movie. Great review, Mark. Very nice read, man! It’s a fabulous flick, Vic. I love it myself. Thanks for stopping by, my man. I appreciate it buddy! Acclaimed Scorcese movies have come and gone but this is hands DOWN the most memorable one of them all, when it comes to me. Your review echoes closest to what I feel about it! Very nicely written there.